I ended up getting into a conversation yesterday based on my post regarding the longevity I have played Final Fantasy XIV. Like I said yesterday I have been back in Eorzea since July so this will be going on four months… which for me in my recent MMO history is a really long time to be playing any one thing. I have officially played Final Fantasy XIV longer in this one stretch than I did both Elder Scrolls Online and Wildstar combined if you just count time spent playing the production clients. This got me thinking and my friend as well… what my longest played games might be. So this morning I turned to Raptr, which I have always just left running in the background quietly logging time spent in whatever game I happened to be playing. When you do this you end up with some unexpected results. For the purpose of this chart I ignored anything with less than 100 hours played, which it turns out is a surprising number of MMOs including Lord of the Rings Online, Warhammer Online, Guild Wars 2 and a few others. The fact that almost 40% of my time spent playing MMOs has been in World of Warcraft was not a huge shocker, considering I played that game for roughly 7 years without taking much of a pause. The fact that Rift weighs in at number two is also not a huge shock, considering I have played it off and on since release. What did surprise me is that I fully expected Everquest 2 to be in third place, as it is one of those titles I keep cycling back to periodically. I guess the thing is that I don’t end up playing it for terribly long before the combat system ends up frustrating me and I move in. In the year it has been out Final Fantasy XIV has shot to the number three spot in total time spent in an MMO with 536 hours. If nothing else I feel like that is pretty telling of just how much I am enjoying this game. 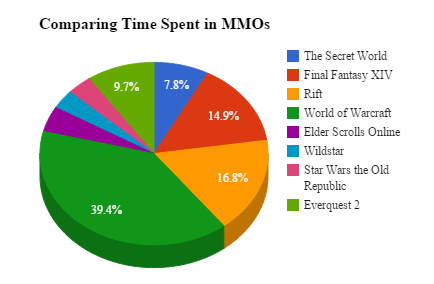 The last revelation is that I found it interesting that I spent roughly the same amount of time in Elder Scrolls Online, Star Wars the Old Republic and Wildstar. Wildstar was the lowest of the 100 hour plus club weighing in at only 122 hours. Elder Scrolls Online was the highest with 163 hours, but were we able to include the year I spent testing that game I would have probably overtaken Everquest 2 at least. With Star Wars the Old Republic I could have sworn I spent more than 127 hours playing the game, so it really makes Wildstar and SWTOR almost exactly the same… which is strange considering that I never got a character to maximum level in Wildstar, but managed to level three in SWTOR. I guess the content grind really was that much faster in SWTOR than I realized. In any case it is interesting to look at the data and see where your time has been spent. Raptr by no means is an exact science, but I have it running on both my desktop and my laptop so in theory the data should be relatively complete. For some time now I have focused on my Warrior job in Final Fantasy XIV as my main. I figured it was the one that I needed to be geared the most since I was going to end up tanking for my free company when we raided. However since launch I have also really liked playing a Dragoon, and for the purpose of Duty Roulette I almost always queue as DPS. Ages ago I got all of my jobs that I have at 50 to ilevel 90 so that they would be viable doing pretty much anything I cared to dip my toe into. 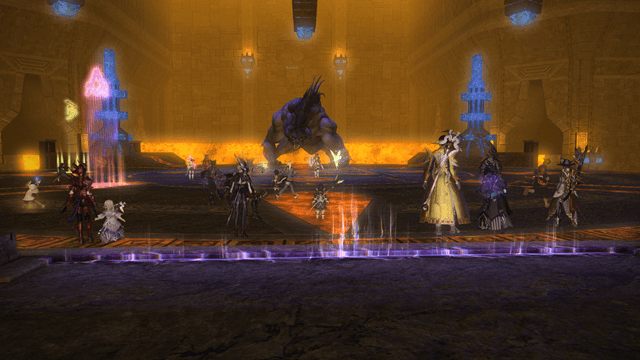 However before we started contemplating raiding, I picked up a handful of pieces out of Syrcus Tower on my Dragoon placing him slightly ahead of the pack. Since the unlocking of loot in Syrcus I have been spending most of my time there trying to get him gear. Right now I still figure that most of my soldiery needs to go to finishing getting the warrior to ilevel 110 or better, however at 108 I am still leaps and bounds ahead of a lot of my guildies. Factoring that in I figured I could splurge a little on my own wants for awhile. When playing any class my focus has generally been on getting a new weapon. It always feels like the most significant improvement, because it is that object that is most visually noticeable when you swap out a single slot. As a result it has annoyed me for some time that I still had my Gae Bolg Zenith weapon on my Dragoon. I could after all start the Atma grind, and the Animus book grind… but really in the grand scheme of things I do not have the money to get through the Novus step… so while I want to finish these for the sake of finishing them, it is not exactly a pathway to a better weapon for me. With the uncapping of Syrcus Tower it means that we have ready access to Unidentified Allagan Tomestones, the precursor step for getting the Weathered(100) and eventually Unweathered(110) weapons. So while I started out running ST over the last few days to pick up level 100 gear for my Dragoon I have ended up essentially grinding out one of the weapons. Last night I finished my grind to 1300 Tomestones of Soldiery and as you can see in the above screenshot I am the proud wielder of a shiny new Liberator lance. Unfortunately this happened like moments before bedtime for me, and I never really got to try it out. So tonight my plan is to run a quick Syrcus or Labyrinth to see how good it feels to have bumped up 20 levels in weapon ilevel. When I got my 110 axe on my Warrior, it was a massive and immediately noticeable difference, and I am hoping it will feel the same on my Dragoon. After dumping this 1300 “bookrocks” on a weapon, I will now return to gathering them up for the purpose of finishing out my set of Soldiery gear. That means I will need a ton of Sands of Time however to get those pieces up to 110 ilevel, which means I will still be running a truly silly amount of Syrcus Tower. In the grand scheme of things though I enjoy running it. I never see it as a grind, because it still feels very epic to me. 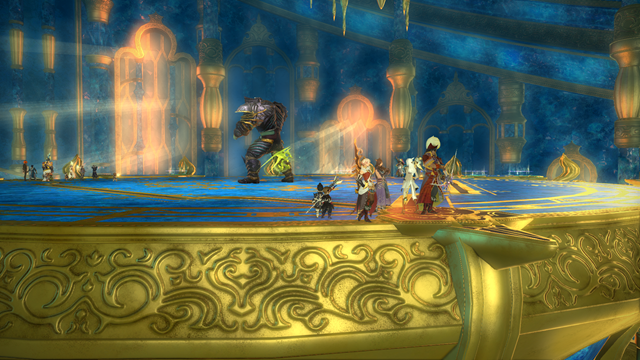 I feel about ST the way I feel about various WoW raids that I used to solo for fun. It feels like I am doing something epic and important, even though it is content that is very much “on farm”. This morning I am going to get by with just a two section blog post. Each of those sections took awhile to write so I figure it all shakes out in the end. This morning for my Month of Thankfulness post I figured I would talk about something fairly unlikely. Yesterday at work I had my annual performance review, and even though I am in many ways the pocket expert on so many systems we have… it is still a process that I find stressful. I think most sane and rational people have these moments where they feel like they are a giant fraud, and these seem to hit me just before I go into my yearly performance review. Yesterday was the same as every year, lots of anxiety for no reason. Once again I had a fairly glowing review, but I am kinda just beating around the bush here. What I am thankful for is my boss. When I started out in my current position my little sub group got passed around like a hot potato. At one point I had been under six different managers, four directors and three CIOs… and had only been with the company for two years. Then my current boss took the position. I have to say when he took over I was suspicious, because I had never seen him in a managerial light, however he has done an amazing job. I really respect the focus he has placed on making our environment not only productive, but a very fun place to be. Each of us has our own “kitch” and for the most part he supports it all. It is the first time since my very first job… that I felt like I had a work family. This is also the first group I have ever willfully attended the Christmas Party for… and we do all sorts of outside activities like most recently going to the RiffTrax showings. So this today I am thankful for the effect he has had on improving how I think about my job, and the fact that for the most part I look forward to going into work each day and seeing my team mates. Sure each of the members of our team is a self starter, but it is his focus on morale that has made the entire thing work.